Tell us about how Friends International started. Who started it, when and why? Give us some historical context. We’re 25 years old next year (2019)! We were started by three people who were traveling through SE Asia, arriving in Cambodia in April 1994. This was the time when the United Nations Transitional Authority Cambodia was in the country, and overseas aid was flooding in to rebuild the nation after decades of conflict and genocide. However, our founder Sebastien Marot and his two friends were shocked to find many kids living on the streets with no-one looking out for them and felt strongly that something could be done to get these kids off the streets and back into society, and that was (and basically still is) the mission that drives Friends-International. Friends officially launched on August 1st, 1994, with 17 kids coming to the first shelter. Since then it has grown into a social enterprise, mixing social work with a sustainable business model, reintegrating children and youth back into their families and society, supporting them through providing direct services when and where needed (Saving Lives program) and getting them back to school, into training for decent employment and providing training and income generation support for parents too (Building Futures program). Last year, together with our partners in our global ChildSafe Alliance, we worked with over 130,000 children and youth. Tell us about Friends primary projects, such as the ChildSafe movement and the social enterprise restaurants. Why are these important in Cambodia specifically? What makes the projects sustainable and lasting for future generations? Over the years we saw the need for raising awareness of the protection of children, and in 2005 launched ChildSafe. ChildSafe is a movement that everyone can participate in – individual citizens (including visiting tourists), communities, businesses, local authorities and government. We provide training, tools and resources to these groups to create protective networks, which ensure environments in which children can thrive safely. We address a multiplicity of issues that place children here in at-risk situations, such as begging and unnecessary institutionalization, and also factors such as road and water safety. We train key local community members (taxi drivers, street sellers, community chiefs, etc.) to be ChildSafe Agents, able to monitor and take action in situations where children are at risk of any form of abuse or harm. We also create resources for visiting travelers and tourists. Our 7 Tips for Travelers informs how to be responsible and protect children, and we also have Good Practice Guidelines in Child Welfare in collaboration with key players in the travel sector to ensure that child protection is recognized as a crucial responsibility for the travel and tourism industries. Talk to us about your social business programs. How do they demonstrate self-sufficiency within your organization? Our social businesses enable the young people participating in our training for employment programs to get that training within a real business environment, such as restaurants, garages and beauty salons, so their subsequent transition to employment is very smooth. We ensure our trainings are linked to market needs – we train to build futures through giving skills that will lead to secure employment. For example, with tourism growing annually, the hospitality sector in Cambodia is also experiencing year-on-year growth, so our high quality hospitality training enables excellent job placements for those students. We use the profits from our social businesses to support our program activities, enabling us to be less donor-dependent and much more sustainable, and through ChildSafe resources we encourage tourists to support our social businesses, as doing this has a positive impact upon young lives. Tell us about the Friends team. Are they volunteers or is it a full time job? What types of daily tasks do they do? What excites them about work every day? Our teams are mostly full-time employed locals. This is a very important part of our ethos – wherever we work, foreign staff do not interact directly with those we are supporting. Foreigners are there to provide technical support to our teams in the field. This makes sense because the teams understand and are able to communicate easily with the children and families because they share the same culture and language. Our staff includes social workers, teachers, doctors, and other professionals who provide both community-based (outreach) and center-based (training) services. We also have strong administration/HR and financial teams, child protection experts and great people in our business and marketing teams. We do also value volunteer support, normally three months minimum, and they will not be working directly with our beneficiaries. We have very strong views on ensuring volunteering is done well and actually benefits the children and communities in the right way. We don’t like ‘pity charity’ approaches that exploit the hardships the children face, and prefer to talk about the #everydayheroes who are changing lives for the better through their work. It is often difficult, can sometimes be very distressing, but ultimately really rewarding when we have been successful in ‘Saving Lives and Building Futures’ for a child, young person or family. What is Cambodia like? What do you like most about living there? For someone who hasn’t been there, what is super special about it? Cambodia is a fascinating, complex, fast developing, often confounding, yet really exciting place to live and work. Sometimes, particularly amid the buzz and bustle and rapid growth of the cities, it is hard to equate the fact that less than fifty years ago a terrible genocide followed by a long civil conflict was taking place here, decimating the population in the process. It is still a country of contrasts – extreme wealth sitting next to extreme poverty, tumbledown shacks in the shadow of towering skyscrapers, gentle countryside where people farm in the same way they have done through centuries, a subsistence existence that drives the young people from there to the cities to seek a better life. Those young people make up the most sizeable chunk of the population, and personally seeing how they move forward and embrace and instigate change is what excites me about living here. Having come here for five months thirteen years ago, I can vouch that what they say about Cambodia, that once you have spent time here you may go away, but you will never leave, is essentially true! If there’s one thing you’d like to world to know about social change in Cambodia, what would it be? I would like the world to know that social change in Cambodia has triggered a movement that can bring about social change globally! 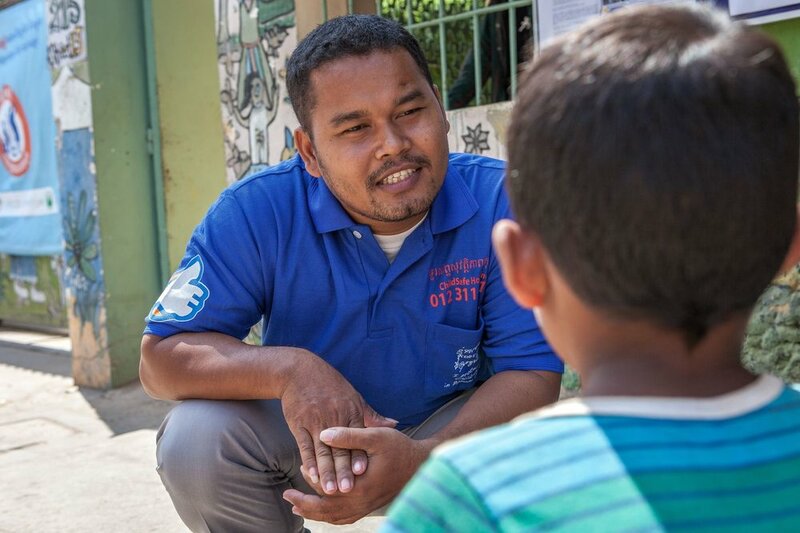 Although the ChildSafe Movement was launched and has ‘grown up’ in Cambodia, it is truly global, and the approaches we use here and the lessons we have learned are applicable anywhere. You can be ChildSafe at all times, not just when visiting countries like Cambodia, but wherever you travel, and when you go back home also. ChildSafe enables us all, individuals, businesses and agencies, to take action in protecting children, when we are traveling and when we are in our own communities. Cambodia has in fact given us social change models that are replicable even in the so-called developed world. For example, currently we are working with a major UK University to implement the ChildSafe Community Agent model with taxi drivers in Manchester! Want to get involved with Friends International? Learn more on their website here, or join us on our cycling trip from Siem Reap to Phnom Penh and meet them in person!